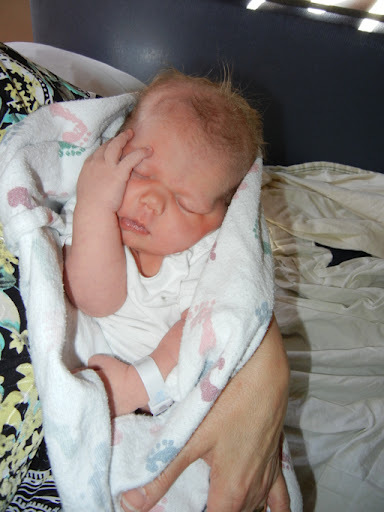 When we last spoke, Olivia had just arrived into this sunshiny world. A healthy 8 lbs, 9 oz, 10 fingers, 10 sweet little toes, a good eater and a happy baby. Since then, an entire month has passed. Olivia continues to do great - growing like a weed, sleeping in 3 hour stretches at night already, and fits perfectly into our family. It hasn't always been roses, however. Our first couple of weeks after the grandmas went home and went back to work were pretty rough. Isabel was craving the attention she had spent the past 17 months getting used to and mommy had her hands full feeding an infant every 2 hours or less on practically zero sleep. I'm amazed that we got through it with only a couple of hits and bites (Isabel pretended to kiss Olivia once and actually bit her!). But now we have fallen into a routine. I can not imagine my life without this precious baby girl and enjoy every single snuggle I can get. She loves to be close. When she is upset, the closer you snuggle her, the tighter of a ball she can get into, the faster she settles down. She is incredibly strong already - I know it will be just a short time before she is crawling around playing with her big sister. She also loves to make eye contact and loves to be talked to. She rarely cries unless she needs something and is such a go with the flow little one. 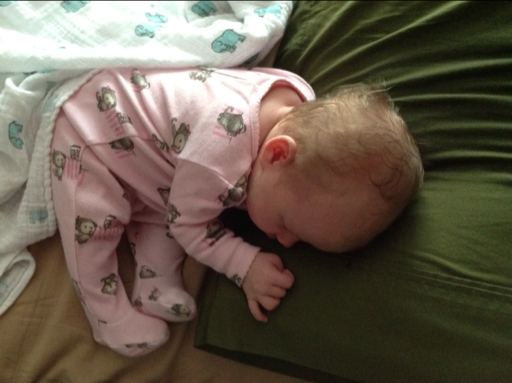 We joke that Olivia is koala baby because all she does right now is sleep, eat and snuggle. This is one of her favorite koala baby poses. I still can't get over how tiny she was. I barely remember Isabel being so small! 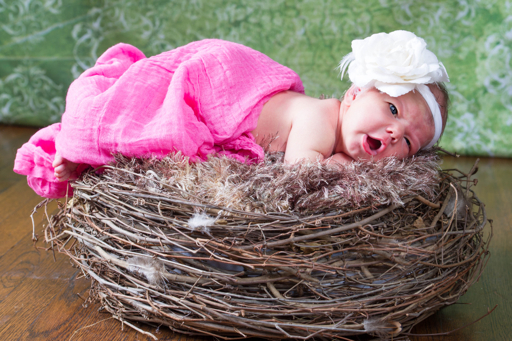 This is one of her newborn photos taken by Christy from our church. Such a sweet little bird. Four weeks old and getting bigger every day. 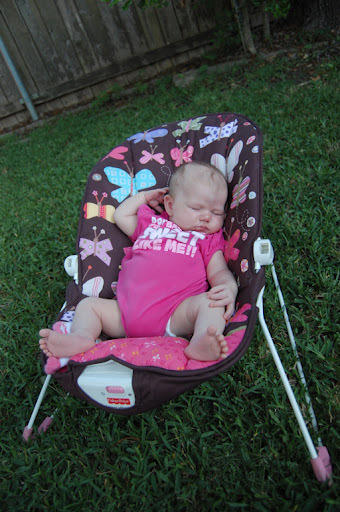 Already wearing her 0-3 month clothes and filling them up nicely. And don't they look cute on her? 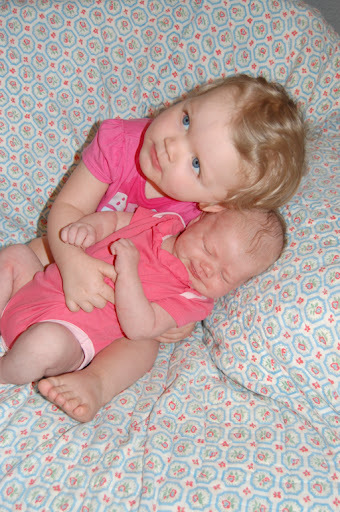 This was the first time that we let Isabel hold Olivia. It was hilarious. We put Isabel on the corner of the couch so there was less danger of Olivia rolling off and put little sister in big sister's arms. She was so stunned that she didn't know how to react at first, but the she really got into it and started kissing her over and over. 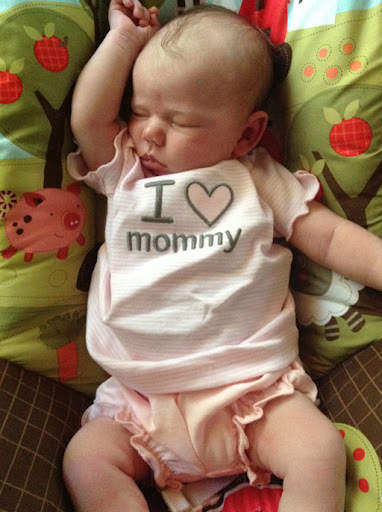 Then in an instant, she decided she was finished and was ready for Nana to pick her up again. I had to be fast with the camera, but it was a heart melting moment. And now here we are... Five and a half weeks of being a family of four and loving almost every second of it. Looking forward to many more months, tons more photos and watching my girls grow to love each other.